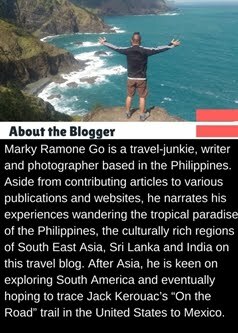 Worn out from my daylong journey from Manila, the thought of feasting over Sambal-spiced Indonesian cuisine left me salivating heavily. A downpour greeted me as I alighted out of the train. Fortunately, I stepped right out of the station into an empty taxi cab that took me to my hotel, where I quickly crashed into my bed. Like a corpse coming back to life, I awoke the next morning nary a dream and at the exact position I slept with; right cheek down and arms outstretched on the bed. A luster of morning light peeking from the sides of my room’s curtain revealed a bright, sunny weather, a stark contrast from yesterday’s glumness. Jolted to full awareness, I hurriedly prepared and penciled out the Caldera of Kawah Ratu as my first destination to visit in Bandung. 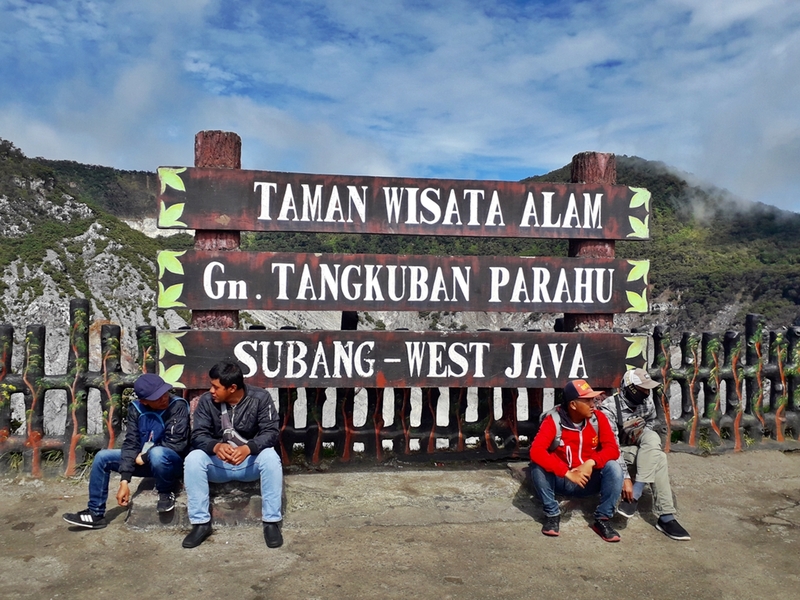 Situated an hour and a half from the city center of Bandung, Mount Tangkuban Perahu is an active volcano that erupted in 2013. Its main caldera is referred to as the “Queen’s crater” or Kawah Ratu, the biggest among the volcano’s three craters. 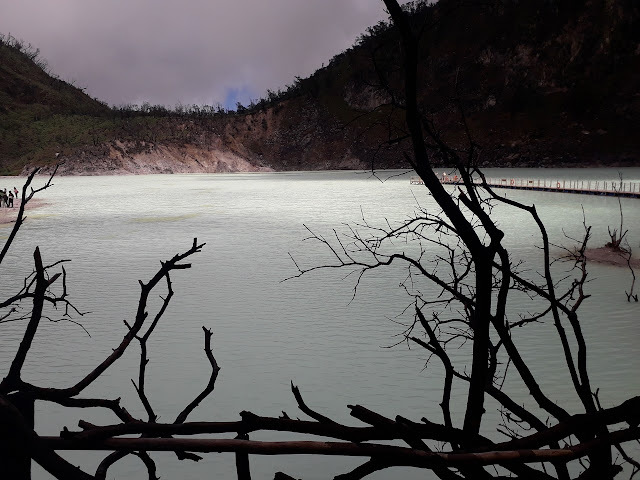 A fenced viewpoint stretching a few hundred meters edges the other side of Kawah Ratu. Walking to find a better angle to view the caldera, I noticed steam billowing from various holes on the ground. Overheard from a tour guide, the rising steam actually emits poisonous sulfurous gases, which can render you unconscious if you happen to stand within its 30 meter radius. I spent a couple of hours just staring at this beautiful anomaly of nature: A hodgepodge of boiling underground streams, along with the peculiar sludge of soil and boulders resulting into a desolate yet stunning landscape. Feeling chilly from the February wind, I started walking down toward the beat up van I rented that was parked at the gate of the national park. The driver said, “You [sic] more than one hour” the moment he saw me. I got worried that he would charge me more, but then he added “I know, you enjoy [ed] it. Really beautiful, huh?” before giving me a thumbs up. “Yes, indeed, it is pretty,” I said. The next day, I journeyed to the village of Ciwidey. 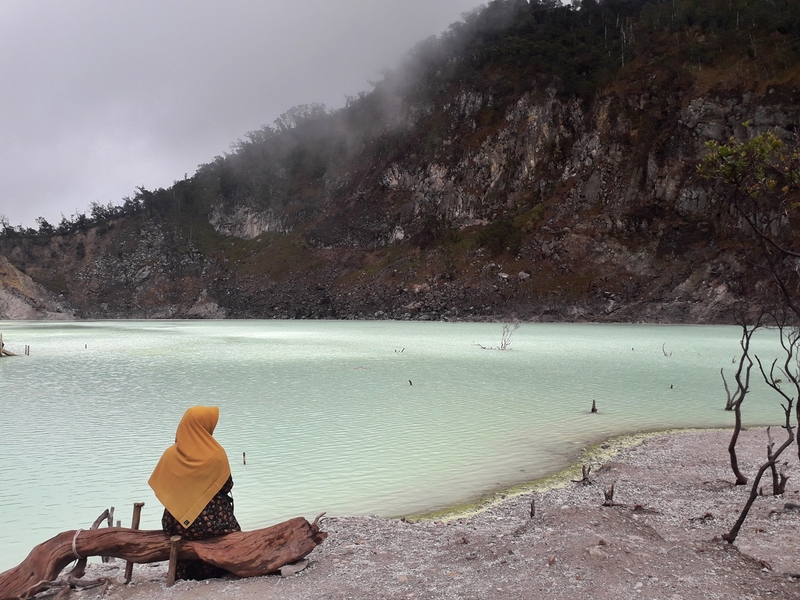 Situated almost 40 kilometers from Bandung, it is known for the Kawah Putih or the white Crater Lake. After alighting at Ciwidey town from a cramped angkot, a van converted to a public transport, I hired a motorbike rider to take me to the Kawah Putih Park. For half an hour, we snaked our way through the zigzag roads passing by strawberry and tea plantations, rice terraces and a mossy forest. 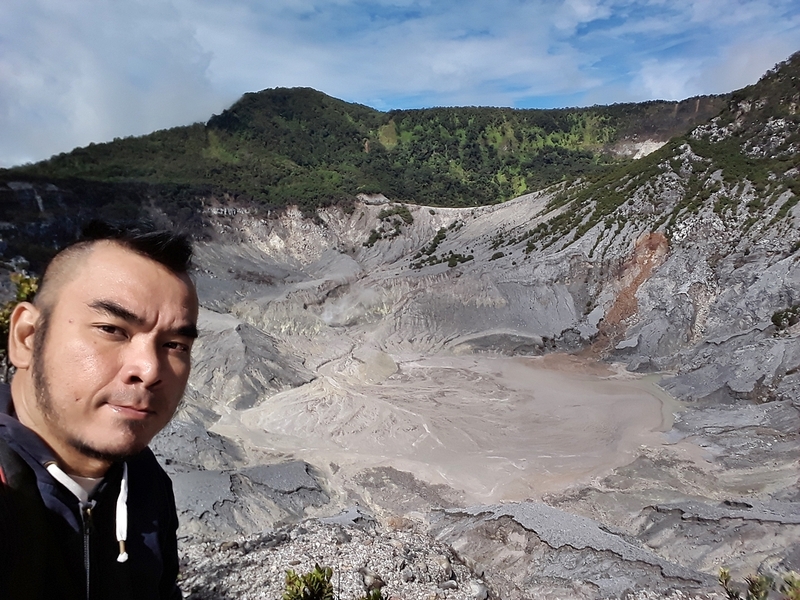 Similar to our own Mount Pinatubo, Kawah Putih Crater Lake was formed after a series of volcanic eruptions. Here you can find a beautiful trick of nature that shaped another otherworldly bright turquoise lake that gleams in a blinding white color under the sun. With an acidity level of 0.5–1.3, it is so unsafe that you cannot even dip your toes into the crater’s lake. Unaware of this fact, the smell of billowing sulphur warned me to keep my distance from the water, no matter how mystifying it appears. 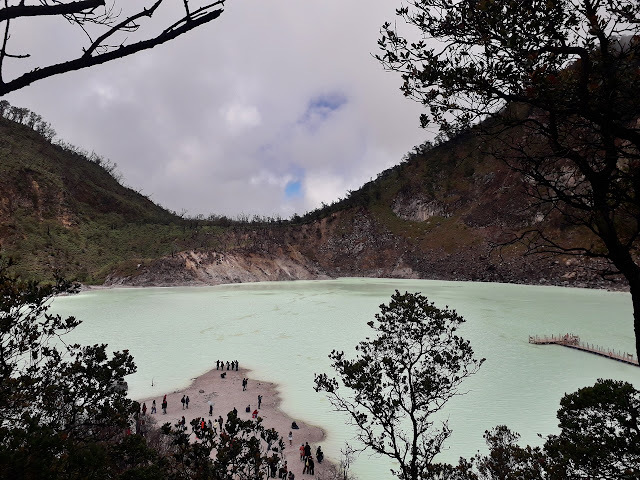 What made Kawah Putih look more spectacular was the way it contrasted peculiarly with the black, naked tree branches protruding from the soil. The forest-covered cliffs surrounding the lake and the bubbling steam of sulfurous gas created a setting torn from the pages of a Stephen King novel. If you cancel out the sight of selfie-stick wielding tourists, you’d feel its unearthly ambiance chill your bones. After back-to-back days of tracking eruption points of volcanoes, I spent the next day indulging in awe of the architecture of heritage buildings along Braga Street in downtown Bandung. A popular promenade street during the 1920’s, the modern-day Braga Street still carries the character of postwar architecture, influenced heavily by the art deco movement. A prominent architect of that period, Charles Prosper Wolff Schoemaker, known as the Frank Lloyd Wright of Indonesia, designed numerous buildings in Bandung, including my favorite building—the Concordia Cinema—that still stands and beautifully preserved. 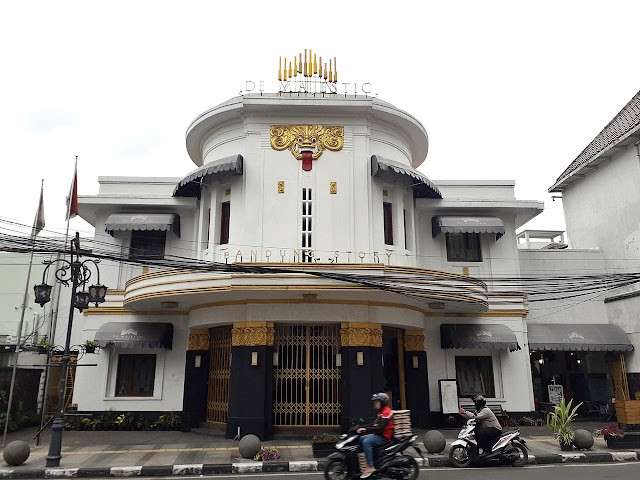 I started my stroll at the imposing 1920’s Gedung Merdeka, also in art deco style, and continued my way toward the corners of several streets parallel to Braga. 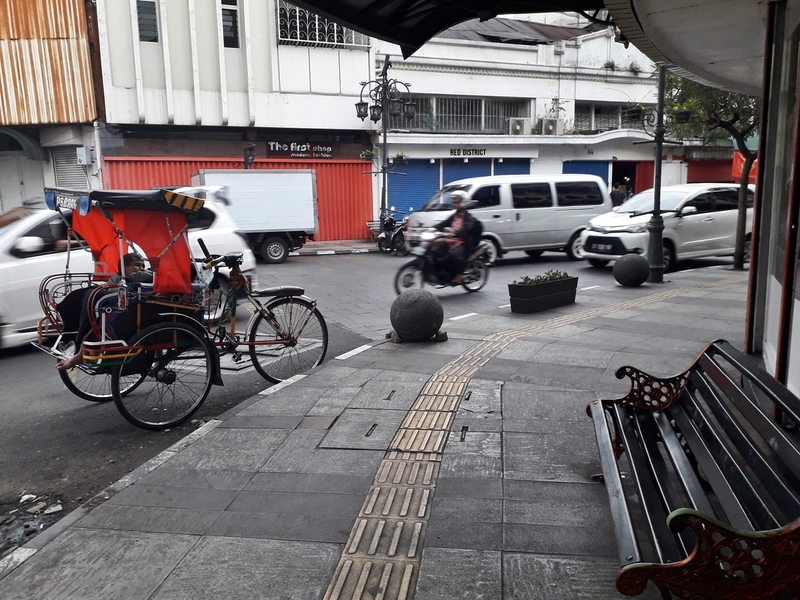 Bandung’s prewar buildings do not only exist along Braga Street, as they stretch beyond other alleys and roads. I must have taken more than 15,000 steps that afternoon as I stayed hot on the trail of Bandung’s heritage architecture. It was after sunset when I realized I was already driving my feet to soreness that I decided to drop by a small café housed inside an old building. Surrounded by paint-peeled walls and seated on an antique wooden chair, I sipped my hot cup of coffee and regaled at the whole experience. 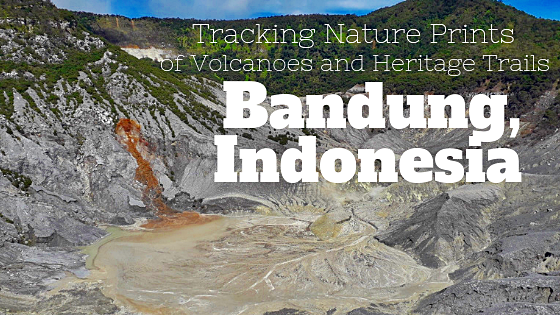 As my toes throbbed in paid, I also felt my spirit and quest for wonder filling to the cusp quickly, thanks to my pursuit of Bandung’s volcano prints and heritage trails.